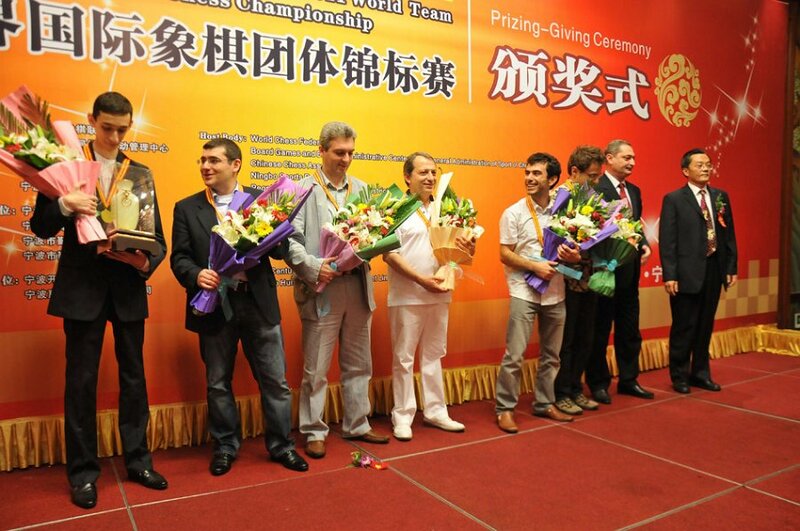 "Yinzhou Cup" 2011 World Team Chess Championship today ended in Ningbo New Century Grand Hotel. Armenia drew 2 - 2 with Ukraine and successfully secured their title, the Chinese team won 2.5-1.5 over Hungary, defending championship Russian team lost 1.5-2.5 to the India team, and U.S. team 2.5-1.5 won over Israel, while the Azerbaijan team 2.5-1.5 won over Egypt. The Chinese team behaved outstanding and won four consecutive rounds. Today's game against Hungary, the Chinese team showed great ambition and determination. Wang Yue played some quite instructional moves in the ending, gained tiny advantage by sacrificed a pawn, and gradually extended it to victory. 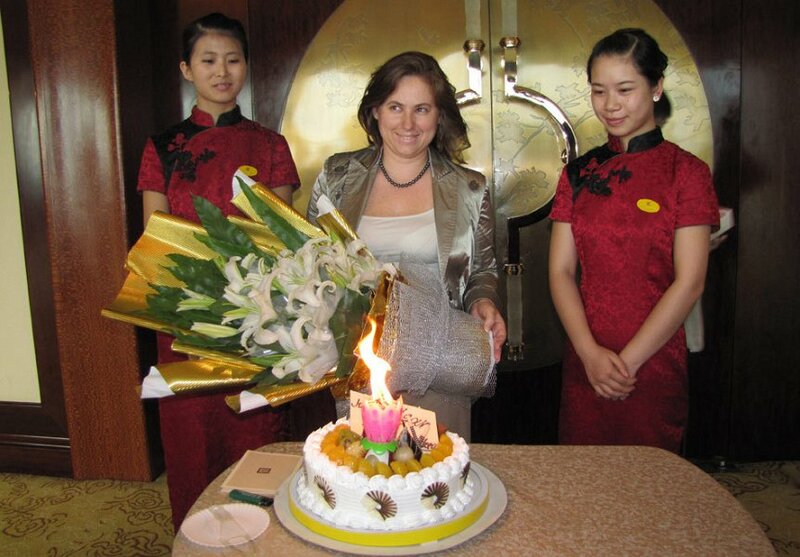 Another eye-catching game was Li Chao versus female genius player Judit Polgar. The young talented Chinese teenager withstood great pressure and triumph on the difficult ending and took one valuable point, helped China to be the runner-up ultimately. Defending champions Russia team had another bad today toward India team and ended the tournament with an very unsatisfied 4 win, 2 draw,3 lose. Russian famous player Peter Svidler obviously out of his status today and he lost to Surya Sekhar Ganguly in only 24 moves.The unexpected quick lost had significantly struck Russian players morale.Young talented player Ian Nepomniachtchi had to risk his game for a try to win, but the result came very grim. Fortunately, he still managed to surpass Akopian to get board gold medal, due to his outstanding personal performance. The final rankings as follows: champion the Armenia team, runner-up the Chinese team, third place the Ukraine team, fourth the Russian Team, fifth the Hungary team, the United State team finished sixth, the Azerbaijan team finished seventh , the eighth Indian team and the ninth Israeli team, the tenth Egyptian team. The board gold medal won by Wang Hao from China (Board 1), Wang Yue from China (Board 2), Ian Nepomniachtchi from Russia (Board 3), Areshchenko Alexander from Ukraine (Board 4). "Yinzhou Cup "2011 World Team Chess Championship today continued round 8 competition in Ningbo New Century Grand Hotel.Score leader Armenia team 2-2 drew with Azerbaijan, slowed their steps to the championship. Chinese team 3-1 won over India and theoretically still got chance for the championship. The Russian team cooperated perfectly and beat Israel team with incredible 4-0, the Ukraine team 2.5-1.5 won over USA, while Hungary 3-1 won over Egypt.Armenian team took 3 points difference in the standings, which means that if they could took one more victory over Azerbaijan team, they would secured the championship. Aiming to win the game, Armenian sent all their top line-up. However, their opponents Azerbaijan team could not been taken easily. After nearly five hours of fierce battle, two teams 2-2 tied. Levon Aronian played pretty aggressive toward Teimour Radjabov but couldn't broke through black's defence, and board 1 game ended drew. Shahriyar Mammadyarov of Azerbaijan team played pretty well today. He started opening with an unexpected powerful new move, firmly controlled the situation and smashed Gabriel Sargissian's defence. Armenia's situation is pretty dangerous, but fortunately experienced player Vladimir Akopian played flawless in the rook-pawn ending and won over Rauf Mamedov. For China and Ukraine the results was good news because those two teams still took the opportunity to claim the championship title. The battle between team China and India is quite eye-catching for every spectator, and ultimately Chinese team surpassed.Chinese board 2 player Wang Yue played quite outstanding today, with a few superb piece-moving strategy, he run black knight d7-b8-c6, and bishop f6-d8-c7 to create huge position pressure toward white. Sashikiran Krishnan struggled hard but was trapped by Wang Yue and finally lost his game. The last round game was arranged at CCT 10:00 A.M. July 26. Team Armenia finally facing team Ukraine and the battle is critical for the final championship. "Yinzhou Cup" 2011 World Team Chess Championship today continued round 7 competition in NingboNew Century Grand Hotel.The Chinese team won the Russian team with 2.5-1.5. As Russia was defeat, the Armenian team's another triumph over Hungary made them still on the top of standing. Armenian champion title almost secured by three points difference.For the other three games, the United Stateswon2.5-1.5 over Azerbaijan,India won2.5-1.5 over Egypt,Israel drew2-2 with Ukraine. The battle between China and Russia team caught most spectator's attention. Chinese board 2 player Wang Yue and board 3 Li Chao make drew with old opponent,Grischuk and Nepomniachtchi,Chinese board 1 player Wang Hao had some critical moment toward Russian superstar Sergey Karyakin.The opening was not quite well for Wang Hao and he couldn't gain any advantage.Even worse,his h line pawn went too far and got caught by Karjakin. However, Russian superstar couldn't found optimal attack strategy in time panic and slipped several opportunities,and finally made the most deadly mistakes ...Ba6? ? Wang Hao grabbed the only chance to win, moved his queen to f7 to crash black's defence immediately. The last ended game was from Chinese young talented player Yu YangYi, who hold tenacious defence toward Peter Svidler's attack and sealed the tough victory for the Chinese team,to end the unbelievable 0-7 history in previous Olympic and World Cup. Leading the rank table, Armenian team continued their hot-streak ,had another victory over Hungary with the contribution of Sergej Movsesian.Unstoppable Armenia team extended their score advantage to three points,followed by China,Ukraine,Russia and Hungary. After one short break-day,“the Yinzhou cup”2011 World Team Chess Championship continues to carry on the sixth round competition today. For the most noticeable battle, the Russian team 2-2 shares half and half with the Ukraine team beyond expectation, the Israeli team 2-2 draws the Azerbaijanian team, the US team and the Hungarian team 2-2 ties, the Chinese team 3.5-0.5 wins the Egypt team, but the Armenian teams overcomes the pressure, and defeat the Indian team with 2.5-1.5, still on the top of the leader-board. As the old saying goes, The road is narrow for enemies,Russia and Ukraine is considered as absolutely on a pair. In the Olympics team competition, more than ten years two teams have competed fiercely and both had the victory and defeat. This made a lot of spectators thought that today this competition will become a gloomy contest, but far beyond expectation, two teams actually had four broads all ends on a draw. However, regarding such result, the Russian team seems very unsatisfied. Because in the match process, the Russian team could have gained the victory if board 3 and board 4 took chance. Russian young grandmaster Ian Nepomniachtchi gained the position advantage but regretfully slipped chances away. Hungary's most famous player, also the men's event most eye-catching women player,Judit Polgar today coincidently on her birthday day. The organizers prepared for her a huge birthday cake as a gift, and the chief arbiter Panagiotis Nikolopoulos given the speech of blessing, all player's applause made Polgar very happy. But she was defeated by famous United State player Yasser Seirawan. Two teams finally tied.